It was the persistence of his high school buddy, Mike Edwards, that convinced Cody Waggoner to sell his reliable Toyota pick-up truck for a 1971 CJ5 jeep. What he didn’t know at the time, was that decision would lead to his participation - and success - in a sport called “Rock Crawling”. Rock Crawling is 4-wheelin’ taken to a whole new level. It means driving over boulders and hills, sometimes at 90 degree angles. It means navigating courses that could split your jeep in two with one miscalculation. “If this is where we wanted to wheel, we knew we had to build the jeep up, first adding the ever so needed power steering and Detroit Lockers. It just continued to escalate, and we kept putting better components on it to make it the tough little CJ Champion that it is today,” shared Lindsay. 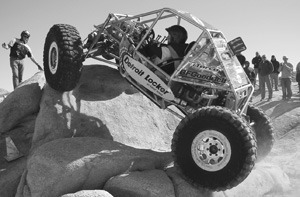 Rock Crawling has been giving audiences an adrenaline rush for the last decade. The driver, the spotter and the vehicle make up the team. The course consists of 8 obstacles which each team must complete. The team with the lowest score, or fewest mistakes, wins. Teams are scored with penalty and bonus points. What started out as a hobby, has developed into a considerable investment of time and financial resources for this close-knit family. Lindsay does the marketing for Team Waggoner and gets the sponsors. It’s been a joint effort building the jeep from the ground up. Cody and Jim work together during the day, Rock Crawling as a team on weekends. Lindsay and two-year-old daughter, Charlie, travel with them. Their first rock crawling - race was in Las Cruces, New Mexico in 2001. Cody and Jim entered the modified stock class at the Warn National Rock Crawling Championship. - After three days of crawling, they walked away with a 2nd place trophy. At the beginning of 2003, they entered the “Put up or Shut Up, Run What you Bring” event in Cougar Buttes, CA. They were up against Rock Crawling’s Biggest Competitors and still managed to earn 4th place. The Waggoners have had 18 wins since. They’re enjoying the ride, and enjoying the benefits of the close proximity their family has shared. Competitions for the rest of 2008 will take them around California, Utah and Washington. The World Championships will be in Sydney, Australia. It was a sport they discovered without intending to, but their efforts at becoming the best they can be have been intentional.